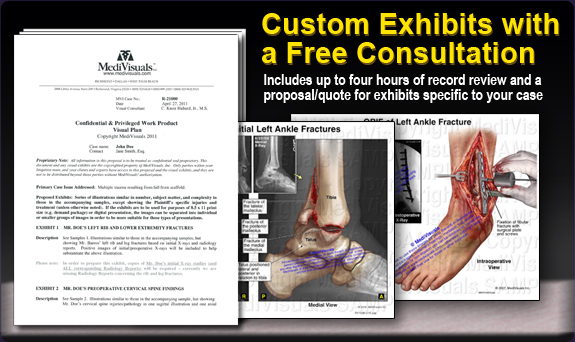 MediVisuals offers complimentary consultations, exhibit planning, and proposals. Our experienced visual consultants will discuss the case with you and offer advice on how to make the best decisions about the content of demonstrative aids and visual presentations. We will suggest the best approach to showing the most effective aspects of your client's injuries and medical procedures, and inform you of graphic options that will add a lasting impact to your arguments. Contact MediVisuals to speak with one of our professional medical illustrator/consultants about your case. To prepare a proposal for your case, it is likely that we will need to review records, depositions, diagnostic films, and client photographs relevant to the case. Applicable diagnostic films and photographic references are helpful, but sometimes they may not be necessary for us to prepare the proposal; however they may be required in order to complete the exhibits. We will inform you of the necessary records and information that we will need to develop a comprehensive proposal for your case. After we receive all of the necessary records and information, a medical illustrator/consultant will develop a Visual Plan outlining and describing suggested visual aids and their associated fees. This Visual Plan will be sent to you, often with color samples of similar exhibits, for your review and response. Up to four hours of record review and development of the proposal/quote is complimentary and you are under no obligation to make any purchases. After reviewing the Visual Plan, you may contact us and accept the proposed exhibits as they are described, or discuss with us any needed modifications. Your acceptance constitutes an Agreement for us to begin work on the creation of the exhibits and the illustration fees, independent of their future presentation method, will be billed to you. You will receive preliminary drafts for you and your experts to review as soon as they are developed. These will normally be sent via email. We will make reasonable modifications to the exhibits for no additional charge. Multiple rounds of modifications or extensive reworking of the exhibits may accrue additional hourly fees. When the exhibits are satisfactory for your specific needs, final versions, including enlargements if desired, will be produced. Our illustrators and producers will work with you and your staff personally to finalize everything as you request. Due to the variety of final prints and output formats, the final output is charged separately from the illustration fees. This will be indicated on the fees page of the Visual Plan which lists the fees for the creation of the artwork and also the additional fees for the type of final output you request. We typically create paper prints that are mounted on sturdy boards in 36" x 48" or 30" x 40" sizes. We can also customize prints to smaller sizes for mediation or oversize prints for life-sized exhibits and timelines. Other final output options include: color 8.5" x 11" prints, digital files for PowerPoint or Sanction use, and digital interactives and animations on CD or DVD. Sometimes obtaining specific radiology films and medical records can cause a delay for attorneys. It normally takes a number of days for us to complete the artwork for a case. Please allow adequate time for this entire process (normally over eight days), or expedite charges may apply. Pricing for exhibits will vary with the complexity of the work that we are creating. Existing artwork is often used from our archives to lower the cost to you. In general, archive exhibits are $335 + enlargement fees. Custom artwork is billed at a typical range of roughly $800-1300 per exhibit. Some exhibits may cost more or much less, depending on their complexity. Enlargement (final output) fees are billed according to the size of the final output and typically range from $180 (30"x40") to $250 (36"x48"), plus $30-45 for protective lamination. Smaller sizes and over-sized exhibits are also available, and the price is adjusted accordingly. A digital file of the exhibit is free with purchase of any enlargement. 8.5" x 11" prints are available for $15 and multiples are offered at $5 per exhibit. There will be standard shipping costs for a cardboard portfolio case and shipping of the exhibits to your location, typically around $95-110 for standard delivery via FedEx. Cases that need to be completed on a rush basis will incur priority service fees proportional to the degree of the rush. Please contact us for more details. We thank you in advance for choosing our services and we look forward to working with you.